Check out how easy it is to care for tillandsia and you'll want to add them your plant collection. Tillandsia, or more commonly known as air plants, are evergreen, perennial flowering plants that belong in the family Bromeliaceae. They are the largest genus in the bromeliad family and are native to the forests, mountains and deserts of Central and South America,the southern United States and the West Indies. Like other epiphytes (non-parasitic plants) that grow on the sides of trees and other plants, tillandsia gather moisture and nutrients from the air; hence the reason for its common name: air plant. A common mistake many newcomers make when caring for air plants is that they believe that the plant is indestructible. Hey, you figured it doesn't need soil to survive, so you can't kill it. True, they do not require a lot to live. Although these plants are tough, they do have minimum requirements to thrive. Air plants prefer bright, filtered light. 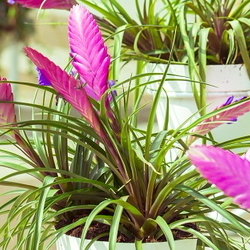 Place your tillandsia in a South, East or West facing window. If you do not get decent natural light in your home, you will need to supplement with a fluorescent light to keep the plants in good health. During warmer days, put your air plants outside in an area that receives bright filtered light. They will tolerate occasional low light conditions if they are periodically rotated outdoors or to an area with abundant, filtered light. Air plants do need to be watered. Yes, they obtain nutrients and some moisture from the air (dust, decaying leaves and insect matter), but they do need to be watered every few days; once a week at a minimum. To really make them happy and increase the chance for them to bloom, you should water them 2 to 4 times a week. They can survive long periods of drought and will bounce back if you forget to water them for a few weeks. The best way to water them is to fill a bowl with tepid water and soak the plants for 10-15 minutes. Don't stress about overwatering them. They will only absorb as much water as they need. The important thing is to ensure that the plant dries completely after a soak and doesn't have any water sitting in the center of the plant or at the base. If you find that your plant has dried out when you were on vacation, do not despair. 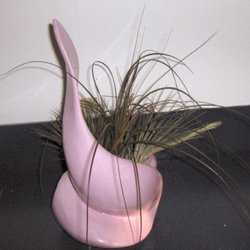 Soak the tillandsia in a bowl of water overnight. Most of the time they will come back. Periodically mist the air plants with water. They like humidity. If you notice that the tips are dry or the leaves are starting to curl, thatís the signal that the plants are dry. Also, tillandsia will become lighter and greyish in color when they begin to dry out. When they are hydrated, they look more green. Place your air plants in an area with good ventilation. Good air movement dries plants between waterings which helps to avoid any disease. You do not have to fertilize your air plants for them to survive, but it will sure make them happy. Fertilizing will increases the growth and vigor of your plants and their blooms. 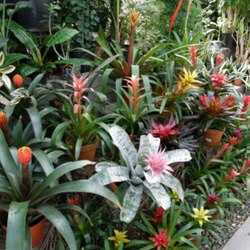 Use a liquid or water soluble fertilizer formulated for bromeliads and dilute. Use the bowl soaking method when you fertilize. You only need to feed air plants once a month. Tillandsia can tolerate temps ranging from near freezing to the upper 90ís. They prefer temperatures in the 70s (F). If your plants are vacationing outside during warm weather, make sure to keep them in the shade during the hottest part of the day and increase watering frequency and humidity. When temps begin to dip into the mid 40s, bring the air plants indoors. Tillandsia undergo dramatic color change as they prepare to bloom. Their blooms are diverse in color, shape and size. Some bloom only for a few days and others for a year! Many varieties bloom in late winter and into early summer. If you want your air plants to bloom, keep up with a regular watering and fertilizing schedule. Air plants reproduce by offsets (pups) or by seed. The plants will send out offsets from the base or in between leaves. When the pups are at least the size of the parent plant, you can remove them. The new plants will take another year to reach maturity. Reproducing from seed is recommended for those of us who are very patient. An air plant grown from seed can take years before it reaches full maturity. Because Tillandsia are epiphytes, mounting options are nearly endless. They require no soil or special medium to grow. You can tie, staple or glue them onto driftwood, tree limbs, cork, pottery, rocks and stones. They can be strung up with fishing wire and suspended, tacked onto a bulletin board, or nestled into small baskets or pockets. There are specialized air plant terrariums available to place your plants in. They are typically spherical and made of glass. I personally display my air plants in little pockets I made with scrap leather. I then use a pushpin to tack them wherever I want. This makes the plants easy to remove when I need to water and feed them. Pair air plants with other bromeliads and orchids. They add a nice design element to any space. With a little care, these attractive little plants will provide you a bit of green during the long winter months. Debbie is an obsessive crafter, home chef, and gardener. She is a freelance writer, blogger, and is a co-author and photographer behind the garden blog, The Prudent Garden; a collection of tips, crafts, and articles that highlight home gardening. When she is not writing, she's out in the garden, chasing her two boys and dog, or curled up on the sofa hidden behind a good book.